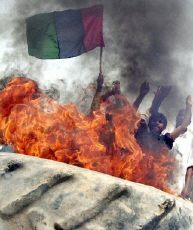 Protesters set fire to a tire in Larkana, Pakistan, Sept. 1, 2002 (Photo: AFP). One year into the global war against terrorism, and the world can congratulate itself that Al-Qaeda and the Taliban no longer pose a military threat to Afghanistan and the surrounding region. But while Al-Qaeda has lost its central base and command centers in Afghanistan, tactical failures by U.S. military forces have led to thousands of militants escaping the dragnet around Afghanistan and permeating the world with more dangerous and secretive terrorist groups. Across Central and South Asia, the aftermath of the war in Afghanistan has led to growing instability and domestic political crises in every country. So far these political crises have been virtually ignored by the West, but they, rather than the continuing war against Al-Qaeda, are likely to define the coming 12 months. The United States, obsessed with its single-track policy of hunting down Al-Qaeda leaders, has not attempted to deal with the political ferment in the region. The Pentagon and the CIA still dominate policy-making in Washington and their strategy has changed little since December 2001 when the Taliban was defeated. The same small circle of policy-makers and intelligence and defense officials who conducted the Afghan war are still making all the critical decisions. The savvy State Department experts and Colin Powell, secretary of state, appear to be out of the loop, as are the U.S. Agency for International Development, the Treasury and Justice departments, and Congress. Were they to have more influence, it is at least possible the United States would be pushing for a wider strategy to persuade Afghanistan’s neighbors to carry out political and economic reforms. Nine months after he became president, Hamid Karzai has still to extend the writ of government authority across the country and rein in the warlords outside the capital. Karzai has been prevented from doing so, not just by the continuing ethnic and tribal tensions in a country devastated by 23 years of war, but by the failure of the international community to deliver on two key pledges it made last December at the signing of the Bonn agreement that set up the new government in Kabul. The first was to mobilize an International Security Assistance Force (ISAF) to stabilize Kabul and five other cities. ISAF is still only present in Kabul and where before the United States blocked its expansion, now the Europeans are failing to come up with peacekeeping troops. Even more dangerous has been the world’s failure to de-liver on reconstruction funds to help rebuild the country. Of the money delivered so far, 90 percent has gone to humanitarian relief rather than long-term reconstruction projects. The legitimacy of the countries surrounding Afghanistan is the enduring problem. In a region where dictatorship is the norm, Karzai is probably the most legitimate leader among most of Afghanistan’s neighbors. In June, he was overwhelmingly elected as president for the next two years by the Loya Jirga or tribal assembly. None of the rulers of Afghanistan’s neighbors can claim legitimacy or a representative government through demo-cratic elections. Only Iran—Washington’s bête noire—has anything approximating a legitimately elected government. In the five Central Asian republics whose leaders still hold Soviet-style elections where the ruler is the only candidate and the vote is heavily rigged, the question of legitimacy has never been more pertinent. Since last October, Uzbekistan, Kyrgyzstan, and Tajikistan have hosted Western military forces for the war in Afghanistan, but they have used their newfound importance for the West as an excuse to step up repression of the people and their political opponents. These leaders continue to reject demands by opposition political forces and the international community to carry out political and economic reforms. Turkmenistan and Kazakhstan, which host no Western forces but have provided facilities to them, have not hesitated to do the same. Ironically, the Western military presence has created the opposite reaction. For the first time since the breakup of the Soviet Union a decade ago, Central Asia’s long dormant and largely underground secular political opposition is galvanizing against dictatorship. Almost all the Central Asian leaders are now threatened by their first significant public political movements and repeated demands for the leaders to resign, as well as the continuing threat of Islamic extremists who were once supported by Al-Qaeda. The economic meltdown and corruption in Central Asia is only adding to young people’s frustration with their leaders. The West has refused to persuade these rulers to change their ways and carry out political and economic reforms. In the next 12 months several of these leaders may find themselves toppled from power. In Pakistan, the domestic crisis is even more volatile, but it is ignored by Washington as long as President Pervez Musharraf continues to support the war against terrorism and provide military bases to the United States. Gen. Musharraf is coming to the end of his three-year military rule and has promised elections on Oct. 10. Yet it is already clear that he is planning a rigged election in which Benazir Bhutto and Nawaz Sharif, the leaders of the two largest political parties, will be barred. In a controversial and heavily rigged referendum in April, he anointed himself president for the next five years. Now he is trying to subvert the constitution to give the army a permanent role in the political system and create a military-dominated National Security Council that will override any future Parliament or prime minister. Gen. Musharraf is now totally isolated. A crisis will erupt either just before the election or just after, when even the army’s “selected Parliament” is unlikely to rubber-stamp all the constitutional changes he wants. That crisis will have overwhelming international and regional repercussions. With a bellicose India at the gates, Al-Qaeda cells planted in the country, the breakdown of law and order as militant groups kill Westerners and Pakistani Christians, an economic recession, and deep polarization between the secular democratic parties and the Islamic groups, the country’s future is at stake. India has until now used the war against terrorism to continue its repressive policies in Kashmir, policies that earlier this year prompted Pakistan to step up support for militant Kashmiris, which in turn led to near war between the two nuclear armed states. U.S. diplomatic efforts have only gone as far as defusing the immediate crisis, but Kashmir remains on the boil. India is determined to hold elections there this month, while Pakistan and the militants are determined to sabotage them. Iran faces a paralyzing standoff between the moderate government of President Mohammad Khatami and the hard-line mullahs. The hard-liners are now determined to destabilize Khatami by backing all anti-Western Islamic groups in the region, be they in Afghanistan, Central Asia, or the Middle East, while the United States has disengaged itself from trying to open a dialogue with Khatami. Political instability in the region is just what Al-Qaeda and other extremist Islamic groups want. An unstable Pakistan or a war between India and Pakistan that leads to Islamabad’s defeat could give the fundamentalists the opportunity they want to establish an Islamic state in Pakistan. The collapse of one or more Central Asian regimes, in the absence of democratic alternatives and a seething economic malaise, could give the Islamic extremists the opportunity to set up new terrorism command and control centers. What is clearly needed is for the West to persuade these regimes that the war on terrorism also means that they have to change their ways. The ideas of “nation building” or “a Marshall Plan for the region”—which are anathema in Washington—are essential if the West is to prevent further instability and catastrophe. The wider implications of such a strategy would be profoundly bene-ficial for improving relations between the West and the Muslim world. However, none of this is likely to happen if the United States pushes ahead with its desire to attack Iraq without international support and while the Middle East is in flames. The Arab and Muslim world will erupt in anger, and terrorism may then become the only platform for many other groups to conduct a war against the United States. Catching the remaining Al-Qaeda cells in the United States or Europe will need patient intelligence work, but Al-Qaeda or its extremist clones can never hope to rebuild a command and support base in the West as they did in Afghanistan. However, in the Central and South Asia region, instability, unpredictable regime changes, or mass movements in the streets can lead to enormous opportunities for Al-Qaeda to rebuild itself. The war against terrorism has entered a much more critical and complex phase that now involves helping to rectify the gross political and economic imbalances in the region. It is going to need even greater commitment by the international community to meet this challenge, not less. This first anniversary is thus a time not to wallow in self-congratulations but to address the problems ahead. Ahmed Rashid is the author of Taliban: The Story of Afghan Warlords.